There are two energy minima, the gauche and anti forms, which are both staggered and thus have no torsional strain. The anti form is the absolute energy minimum, since the gauche form has a small steric interaction between the two methyl groups. At a dihedral angle of 60 degrees, one hydrogen of each of the methyl groups is relatively close to a hydrogen of the other methyl group (van der Waals repulsion). Carefully note the difference between steric strain and torsional strain. The latter arises from eclipsed bonds, while the former arises from atoms which are too close to each other. There are also two energy maxima, both of which are eclipsed and thus torsionally strained. 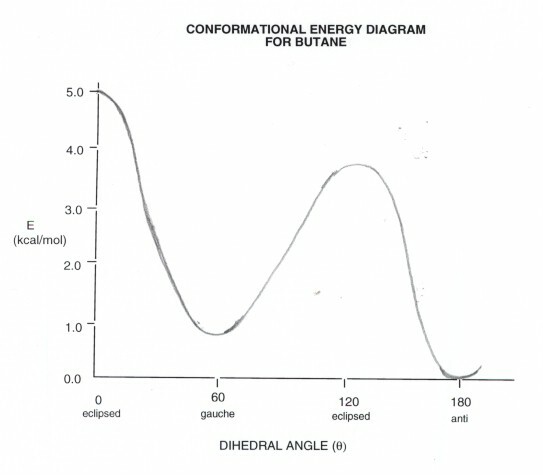 The higher energy conformation also has steric strain. 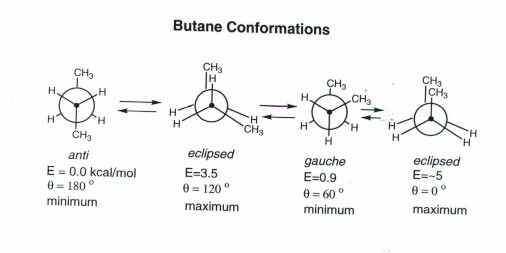 You should be able to draw these conformations and this diagram and attach the appropriate numerical energies to each conformation. You should also be able to identify the type or types of strain present in each conformation and explain the basis of that strain. Torsional strain arises from the repulsion of electrons in bonds; steric strain arises from atoms that are too close!